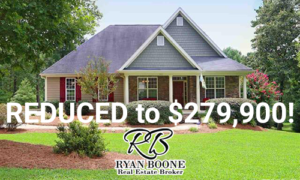 Ryan is very professional and takes a great approach to selling a home. My house was on the market for over a year with two different realtors before finding Ryan. He came in with a new solution, got it ready, and made the complete sale/ move as seamless as possible. I highly recommend Ryan to anyone in the market. This three bedroom, three bath listing in Louisburg’s Lake Royale Golf Course neighborhood was the original builder’s home and you can certainly tell! This beauty shines throughout with high-end custom features but remains wallet-friendly at a list price of $279,900. Set perfectly for entertaining, take advantage of the huge chef’s kitchen with Corian counters and stone accent. There are hardwoods and crown molding throughout this home, which overlooks a gorgeous view of hole #14 at River Golf & Country Club. The stunning formal dining room features beautiful wainscoting. The luxe living continues into the lower level with kitchenette. Also included on the lower level are an additional bedroom, full bathroom, and living area. Don’t miss the sunroom and three seasons screened porch, either. There’s a spacious master bedroom on the main level with trey ceiling and beautifully appointed bath is a luxury retreat in itself. Neighborhood amenities here are too much to list, but HOA dues remain reasonable at $750 annually. View the full details on this fantastic home here and then call or email me to setup a showing! Ryan@HudsonResidential.com or 919-438-0548.